I so wanted a fresh and healthy dessert, easy to make but with this kind of sophisticated look you know. 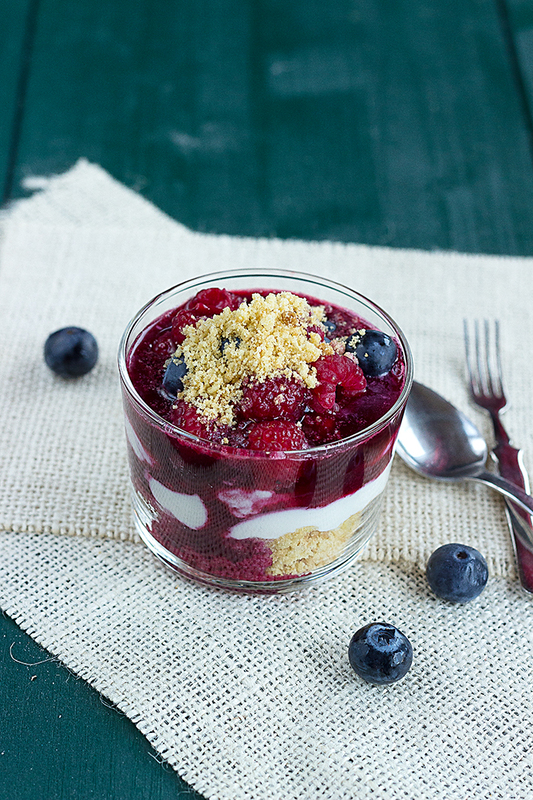 With the summer and everything else mainly, this raspberry and blueberry trifle was the best thing ever. The little thing making the difference? Easy to make and “almost” everybody loves it. And if you are short on time or do not own a sieve, you can serve the fruit coulis like that. I love raspberry, however I do hate their little seeds getting stuck between my teeth forever. Have you ever tried trifle? If you wish to taste a winter one, make this delicious salted butter caramel and pear trifle. Love it, but higher calorific value. In the meantime, sugar, that’s the best thing in the entire world! Keep few raspberries and blueberries. Heat the rest of the fruits in a little saucepan until you get a kind of coulis. Sieve and reserve. Mix mascarpone and cottage cheese with sugar. Place first in your individual glasses crumbled biscuits (reserve a bit to decorate) and half of cottage cheese mix. Cover with red berry coulis. 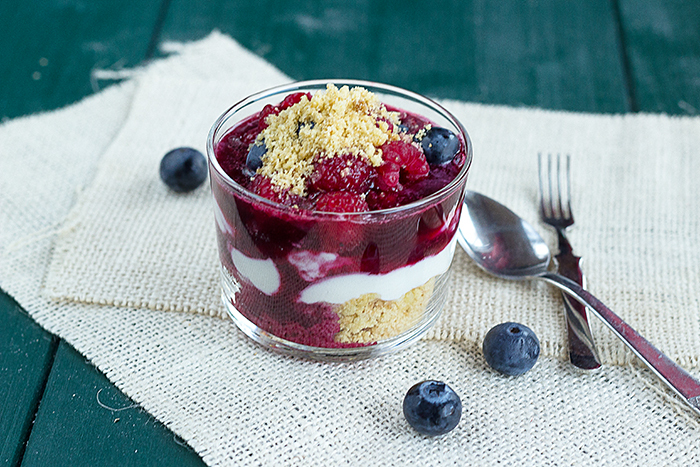 Add the rest of cottage cheese mix and cover with the rest of the coulis, fresh red berries and crumbled biscuits. =) I Love this dessert, same that is higher calorific value. surely one of the best recipes I have ever seen!